Recognise excellence with this stunning deluxe range of medals. 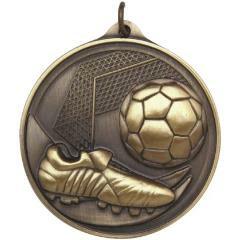 This medal features a shiny gold embossed whistle centre surrounded by a concentric design. Measuring 5mm thick at the edges, these medals have the heavy feel without the heavy price tag, and are sure to be a hit with every recipient! Your text is laser engraved onto a plate then attached to the rear of the medal. Available in shiny gold, silver or bronze with your choice of ribbon colour.